Like everyone else I have been sitting inside for the last couple weeks waiting for the weather to break. I have had to cancel/postpone 8 trips due to wind, cold and or ice recently. I popped a couple of pictures today around the lake. Basically the lake is frozen solid to the splits. From the splits to 208 the main portion is open in places where the wind breaks the ice up. Patches of ice are in the main lake down to Sturgeon. 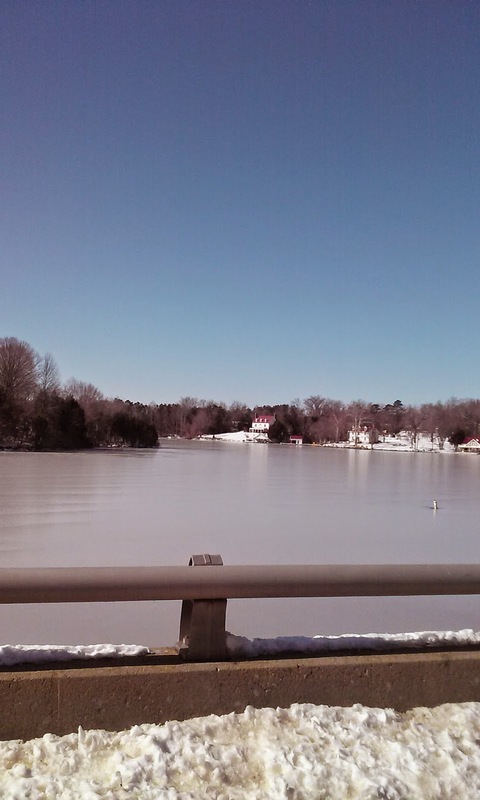 All creeks that I looked at were frozen to the main lake. The backs of the down lake creeks were frozen as well. 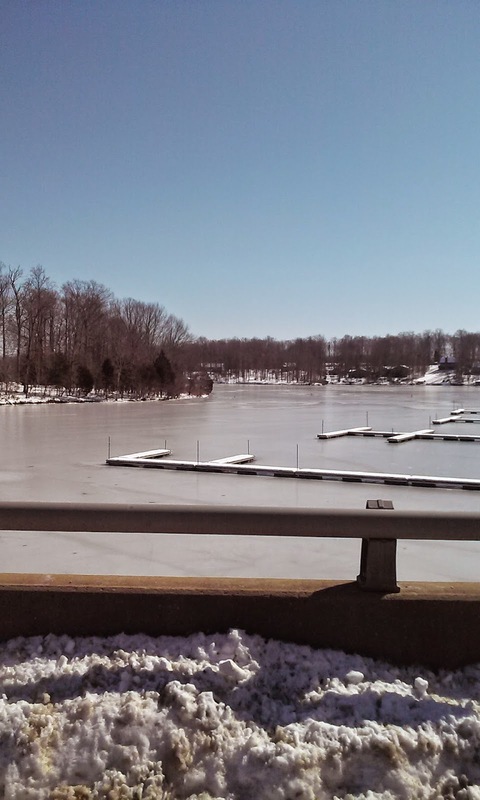 If you can find a place to launch a boat be careful running, there are patches of floating ice through out the lake with the exception of main lake below the power plant. I saw ice thicknesses ranging from 6 inch up and in the backs of creeks to over 3 inches at the 208 bridge in coves. Once the weather breaks I will be back out on the water making up for lost time. There is one good thing that results from a freeze like this. In all the years that I have been fishing for Stripers on the lake whenever the lake freezes like this fishing the following spring and summer is incredible. Most of the Threadfin die off giving leaving biomass levels down increasing catch success. The fisherman simply does not have to compete with so much bait giving us a better chance to catch fish. Last fall there was so much bait fishermen didn't stand much of a chance catching Stripers, they were full most of the time! I had to actually work areas with no or little bait nearby to catch Stripers. This year will be different. Jim, I was at the lake too on Friday. So do you have any ICE FISHING tips for stripers. Hay Jim, Need your help, How do you hook gizzard shad? Across the nose, or up through the bottom to the nose. The only Ice fishing Tips I have is go fish off of the third dike. I hook my Giz through the nostrils.